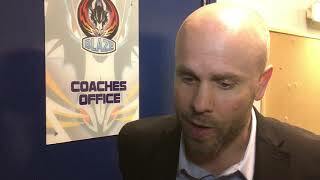 Canadian forward Alex Nikiforuk was again the overtime hero as the Genting Casino Coventry Blaze came from behind to beat the Manchester Storm 3-4 in Altrincham. As per the night before, Manchester got off to a two goal head start early on. Cieran Long, recently called up to the Great Britain national team first beating Matt Hackett in the Blaze goal one-on-one short-handed at 5.39. Dane Byers then doubled the home sides advantage on the powerplay (14.22), with another Team GB player Mike Hammond picking up an assist on both goals. 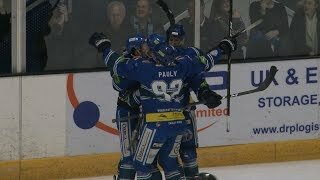 At 18.51, Blaze hit back through the in-form Shawn Pauly, registering from close range on the man advantage for a score of 2-1 after 20 minutes. It took just 1.41 of the middle period for Coventry to draw level. The goal two-on-one with Ben Lake finding Tim Crowder for the pairs 11th straight game with at least a point to make it 2-2. After drawing a penalty himself, another member of GB’s roster Dallas Ehrhardt scored Storm’s second powerplay goal of the night for 3-2 at 27.22. The Blaze though levelled again before the second period was done with Ivan Puzic finding Thom Flodqvist for 3-3 on 32.39. With no score in the third period, both teams took a point and the game went to overtime. 1.24 into the additional period, Riley Stadel was adjudged to high-stick Alex Nikiforuk who then went on to win the game in overtime for Coventry on the 3-on-4 powerplay for a final score of 3-4.